Vegas Slots are 3 slot machine games in single line, 3-line and 5-line format with the shared progressive jackpots. Vegas Slots 5 Liner is a classic five payline slot based on retro Las Vegas slot machines. The game has a single feature which triggers the WINNING STREAK! 3-line and 1-line versions of the slots have the same features and rules. Choose your Total stake between 20p/30p/50p and £150. The Wild symbol can be used to help form winning combos by substituting for other symbols, except the Winning Streak icon. If a Winning Streak symbol is anywhere on reel 3, it triggers the WINNING STREAK Feature. After an initial winning spin the player has the chance to continue the STREAK. Press SPIN IT AGAIN to stop the Dapple on either STREAK or STOP. Getting STREAK respins the reels and awards another win before giving you another chance to continue the WINNING STREAK. Hit STOP and the feature ends, where the player is paid the amount displayed in the TOTAL WON display. 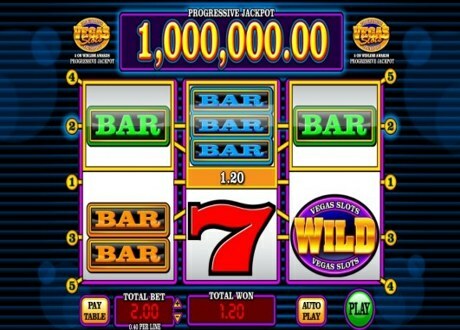 Hit 3 Vegas Slots logos on active payline to hit the progressive jackpot.